The image of a whirlpool is haltingly evocative of the Old City of Jerusalem. The Old City can sweat and whip around you. The city and its conflicts spin around and around. The whirlpool is self-sustaining and it’s hard to stay upright. A visiting outsider just gets flushed through. There are “flare-ups” in the Old City but we’ve grown used to them – despite the fact that flares are often cries of distress, from sinking ships going down. One street in the Muslim Quarter, Taariq Al-Wad, is a nearly-straight physical line stuck through this whirlpool. Taking a moment to look down the street offers a chance to pause and focus on a single angle in the Old City. Taariq Al-Wad is the most direct path from East Jerusalem to Al-Aqsa and the Western Wall, the holiest site in Judaism and the third holiest in Islam. The history of Taariq Al-Wad, however, touches not just religion but prime ministers, murderers and world-famous authors. From Damascus Gate, the street steps down between the panhandlers and soldiers. It ducks past rows of religious trinkets, leather goods, keffiyehs, rosaries, fruit shakes and the occasional vegetable. Also called Hagai Street*, the route stretches through arches, past a few Stations of the Cross, bakeries, bags upon bags of spices and racks upon racks of tie-dye apparel and pantaloons. The history of Taariq Al-Wad also tells us a little about what’s going on inside of the Old City whirlpool. The street was the site of one of the bouts of violence between Jews and Arabs in the Muslim Quarter. On April 5th, 1920, two Jewish residents were stabbed and killed near their homes. During a wave of violence in April 2015, that double homicide was replicated almost exactly. Both of these killings happened on the stretch of Taariq Al-Wad below the Wittenberg House, a hot spot for the aforementioned “flare-ups” and a central point in the street’s history. Any physical or historical view down Al-Wad looks through the arching tunnel below the Wittenberg House: a bulk candy shop at one end, Open Sesame fruit shakes and an Austrian settlement at the other. In the 1880s, a Belarusian Jew named Moshe Wittenberg purchased the property. Wittenberg died in 1899 and it remained a Jewish home – the parents of ex-Prime Minister Yitzhak Rabin first met there. Soon after, during violent disputes around the Western Wall in 1929 and the Palestinian nationalist uprising in 1936, the house’s residents left the quarter. In 1948, the Jordanian government took control of the building along with the rest of the Old City. 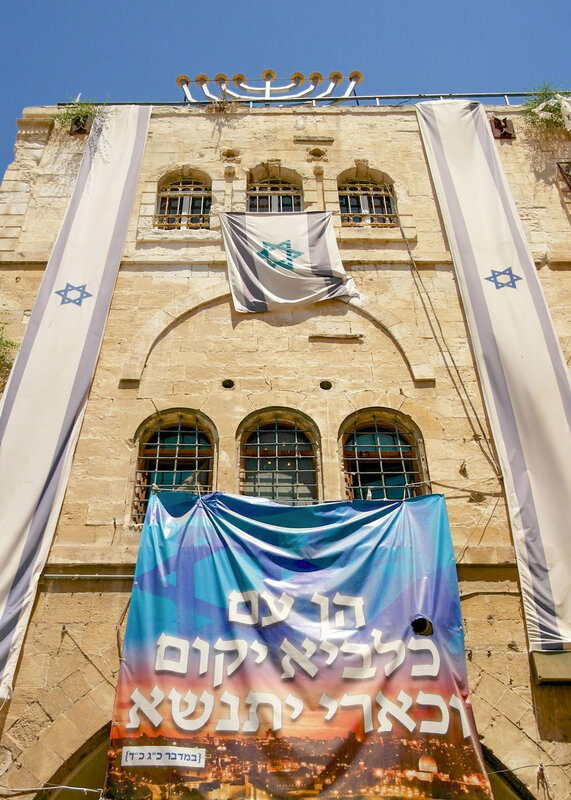 But today, Israeli flags hang down the height of the light stone Wittenberg house, with its six arching, barred windows. A white menorah sits on the roof, as wide as the street below. It doesn’t seem to be a house so much as a watchtower. After the 1967 War, the Wittenberg house became a keystone in the project to spread Jewish Israeli settlements into the Old City and annexed East Jerusalem. In 1987, Prime Minister Ariel Sharon purchased an apartment in the building. He never actually lived there but, in making it his official residence, he offered armed protection and increased state support for Jewish settlers in the Quarter. Thomas Friedman titled his filing on the subject for The New York Times “In Jerusalem, Sharon Apartment Creates a Stir.” The whirlpool gets pushed around and around again. You dive a little deeper in and it gets hard to even see out, hard to see the light of religion or peaceful resolution. Taariq Al-Wad serves as an antidote to something called “Jerusalem Syndrome:” the sudden obsessive spiritual fervor that overtakes visitors to the Old City. It’s equally possible for the Old City to overwhelm through the social and political density of the place. But for anyone looking in, the Taariq offers an anchor in a sense of place – something to grab on the ground to stop the spinning. Pilgrims and residents are all trying to make it here, financially or spiritually, whether “making it” means building the Third Temple of Judaism or pocketing another shekel. Most of those I see trying to “make it” on Taariq Al-Wad are Arabs. I talk with a vendor who bags za’atar – herbs, salt and sesame. He points out his new posters for sale that read “Visit Palestine.” The posters’ image centers on the Dome of the Rock and is ubiquitous in the Old City. It was designed, however, by Austrian Franz Krausz to encourage Jewish immigration and tourism to the British Mandate. Today, Ultra-Orthodox Haredi Jews walk Al-Wad on their way from the north side of the Old City to the Western Wall. The Taariq Al-Wad is of course one line among many in Israel-Palestine: Green Lines, lines at IDF checkpoints, the border around Gaza. But it was drawn out long before the British, the United Nations, the World Zionist Organization or any modern Palestinian politicians uncapped their pens. While the age of the street is unclear, there must have been a route connecting King Solomon’s First Temple, said to have been built in the 900s B.C.E., to the Old City’s walls. One name for the Damascus Gate, Bab al-‘Amud or “The Gate of the Column,” refers to the Gate’s design as it stood in the 2nd century C.E. As a physical line, Taariq Al-Wad is a non-ideological gauge that help us read the whirlpool. The street is sometimes barely wide enough to slip by the man bumping his push cart along the “stirringly important” celebrity stones. As I walk towards the Western Wall plaza, a few Jewish Israelis stop my group and point out the Arabic script on my companions’ bags. “Are you sure they’re American?” they ask. There is an Iraqi-American, a Syrian-American and a gaggle of pasty white people. It sometimes feels that the Jerusalem whirlpool is pushed by a type of political Coriolis force: you follow an stable path for a while but the thought soon curves off course. It’s also true that if the whirlpool were someplace else, south of the equator, say, things would probably flow another way. I write about Jerusalem as a whirlpool rather than a hurricane because there is no “eye of the storm” here: there isn’t really anywhere to stop. But those sucked down in it – residents, tourists, Jews, Arabs, Prime Ministers, cynical American writers – will eventually bob back up. The hurricane image may be applicable in that the intensity of Jerusalem and its conflicts seethes and cracks with the season. And Taariq Al-Wad is only an anchor – a place inside the Old City and its conflicts where we can tie a rope and hold on, so that the whirlpool doesn’t spit us out spinning, coughing and sputtering and no more aware of what’s going on inside this one square kilometer that we keep under a microscope. “Now for several hours I have been trying to comprehend,” wrote Twain. I suggest that he give it a little longer. His last notes on the city: “We are at home again. We are exhausted. The sun has roasted us, almost.” A gaggle of pasty white people in a whirlpool. *I’ve chosen to use the Arabic name for the street because it is located in an Arab-majority area.